One of the more bizarre-looking relatives of the great white shark is the sawfish – named for the long, saw-like snout (rostrum) that makes up 20 to 28% of its body length. This ‘saw’ is equal in width all the way down and has a rounded tip and sharp, tooth-like spikes on either side. It is used to root in the sandy ocean floor to displace crabs, shrimp and other prey as well as to spear through shoals of fish or swipe back and forth to stun or slice individuals. Tiny pores on the underside of the saw allow sawfish to detect the fish and crustaceans they feed on by sensing the electrical currents that emanate from them. This distinctive rostrum gives the sawfish a macabre and frightening appearance but these creatures do not generally intentionally hunt or harm humans – there has only been one recorded case of a sawfish attacking a man without being provoked. However, their saws are formidable weapons that can inflict severe injuries, so care should be taken when they are encountered, for instance when they are mistakenly caught and need to be removed from a fishing line. Conversely, humans have played a major (and sometimes deliberate) role in the decimation of global sawfish populations. Scientists estimate that sawfish have declined by over 90% of their original numbers across all species, with the result that they are currently considered the world’s most vulnerable fish. The irony is that the sawfish’s most highly evolved and invaluable tool has also contributed to the species’ undoing. The spiked rostra become easily tangled in nets and lines and are also prized by fishermen in many regions for their financial value, as are the meat, eggs and fins. Add to this the fact that sawfishes take roughly 10 years to reach sexual maturity and reproduce, and that the shallow coastal waters, estuaries, mangrove swamps and rivers they inhabit are being increasingly damaged, polluted and encroached upon by human development – and it is easy to understand why this fascinating creature is so endangered. Sawfish are shark-like fish (elasmobranchs) belonging to the ray (Pristidae) family. They are also known as carpenter sharks and are believed to have originated some 100 million years ago. They are similar in appearance to sawsharks but they are larger in size and do not have barbels on their snouts. Global sawfish populations have decreased dramatically in recent years and scientists estimate that the various species are now classified as Endangered and Critically Endangered by the IUCN. There are five species of sawfish, of which the largest is the green sawfish, which can grow up to a whopping seven metres in length and have saws of up to 1.6 metres. The smallest species is the dwarf sawfish, which only grows to around 1.4 metres in length. Depending on the species, sawfish can live for between 25 and 80 years. 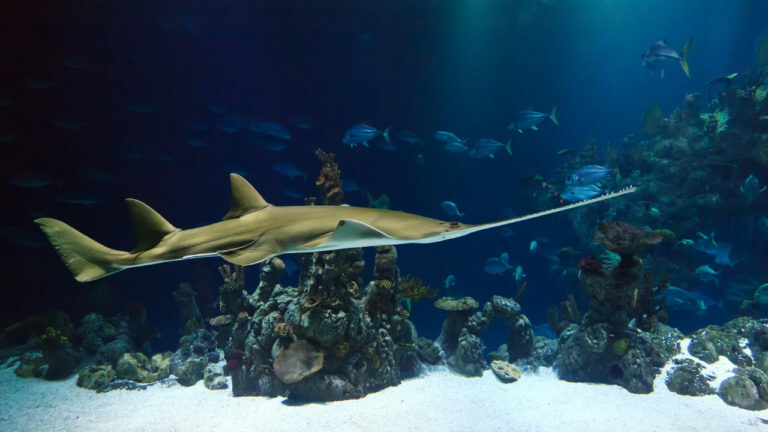 Two sawfish species are found in South Africa – the large-toothed sawfish and the green sawfish – both of which are protected, so it is illegal to catch them or trade in them. Sawfish are ovoviviparous, meaning they do not lay eggs but carry them throughout pregnancy, following which the eggs hatch internally and the mother gives birth to live young. Gestation periods range from a few months to as long as a year, depending on the sawfish species. Baby sawfish are born with their strange snouts fully developed, but the saw is soft and enclosed in a membrane during birth to protect the mother from being injured by the sharp spikes. This covering of skin falls off and the saw hardens shortly after birth. Although sawfish are classified as marine animals, they often inhabit shallow estuaries and have even been known to swim up rivers, so watch your feet when wading in shallow water!